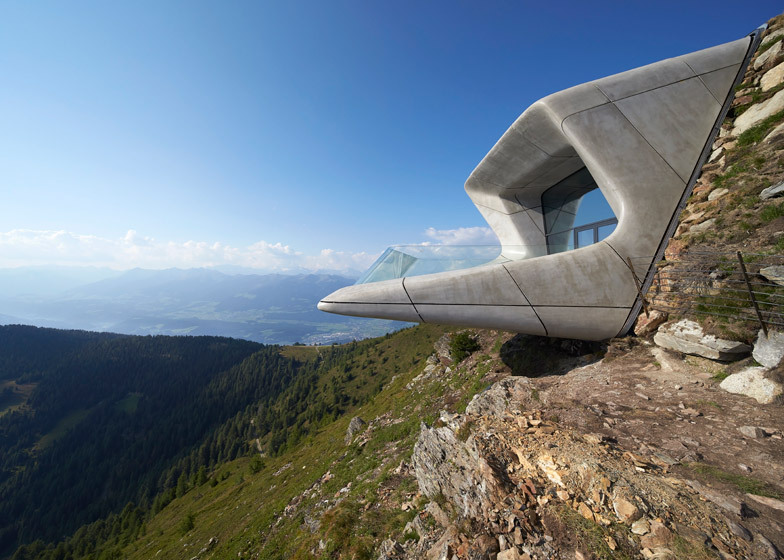 Zaha Hadid completed the Messner Mountain Museum Corones in 2013 for renowned climber Reinhold Messner at the top of Alpine peak Mount Kronplatz. 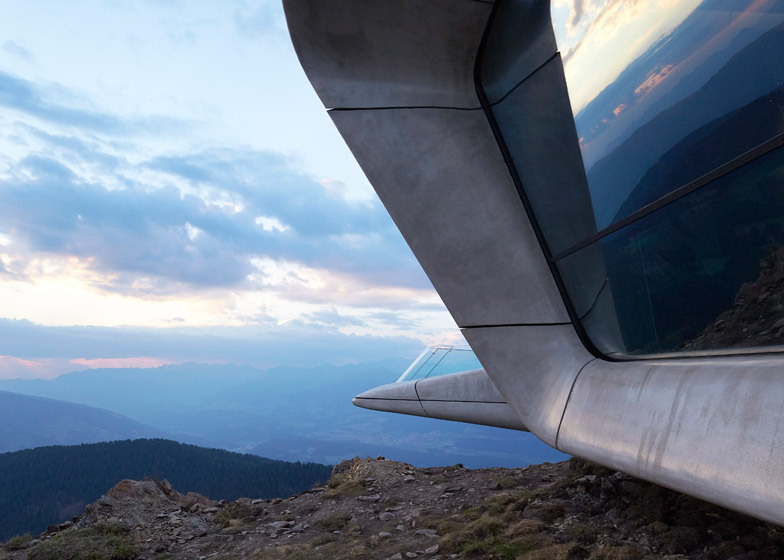 It is the final installment in a series of six mountaintop museums commissioned by Messner, the first climber to ascend all of the 14 mountains over 8,000 meters. 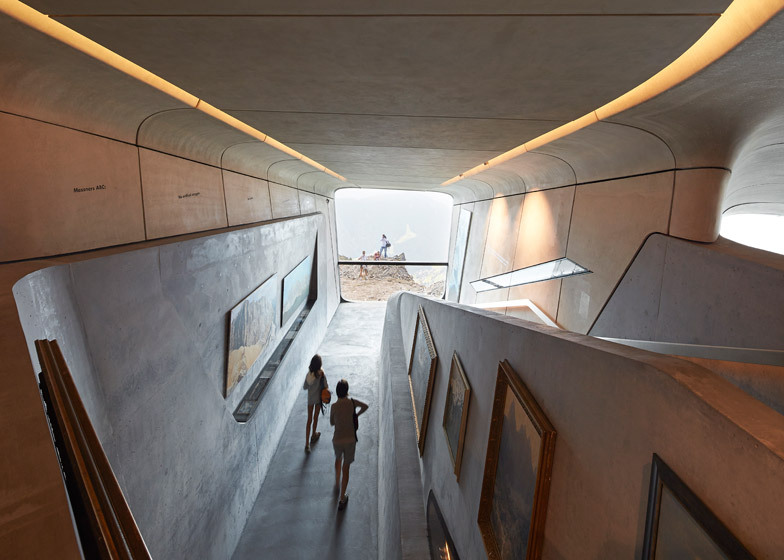 Hadid designed a structure built into the side of the mountain, emerging at different points to offer specific views. Three large masses appear to burst through the rockface, each features Hadid’s trademarked curved forms and are made from glass-reinforced fibre concrete. 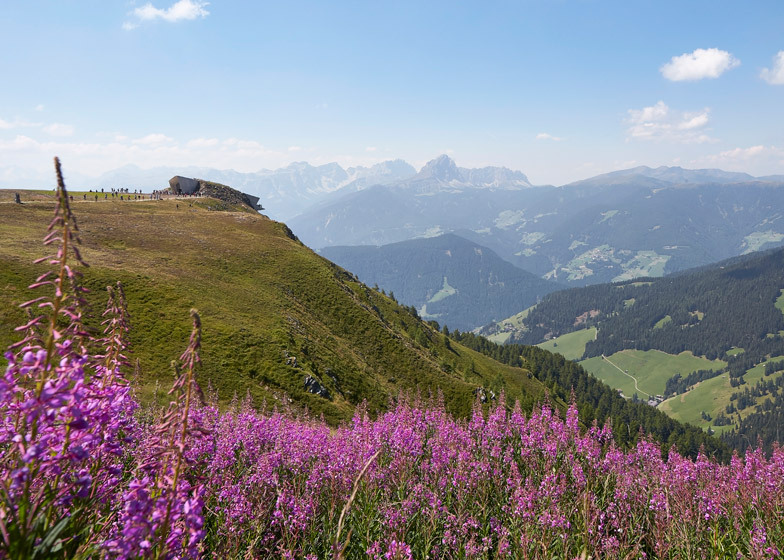 The first two form picture windows, frame majestic views of the Peitlerkofel and Heiligkreuzkofel mountains and the third is a cantilevered balcony that offers visitors a western view towards the Ortler range. 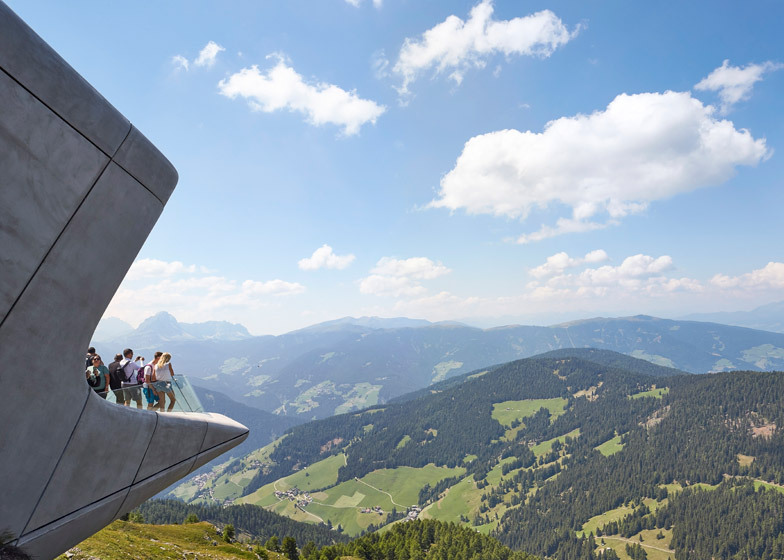 “The Idea is that visitors can descend into the mountain to explore its caverns and grottos, before emerging through the mountain wall on the other side, out onto the overhanging terrace with its spectacular, panoramic views from Zillertal Alps in the north to the Dolomites and South Tyrol.” Hadid explained to Dezeen Magazine. More concrete forms emerge up from the ground to create canopies that define the building’s entrance. 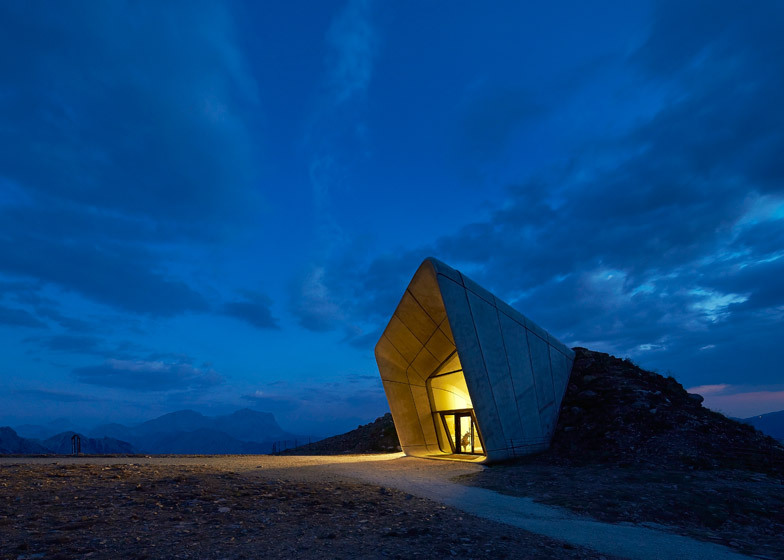 Hadid selected cast concrete to give the appearance of ice and rock shards which reference the geology of the region. The glass-reinforced fibre concrete gives the exterior of the building a pale grey tone, while the interior panels are darker to remember the lustre and tones of anthracite coal. Zaha Hadid’s style is distinctively neofuturistic; characterized by powerful, curving forms and elongated structures with multiple perspective points and fragmented geometry to evoke the chaos. 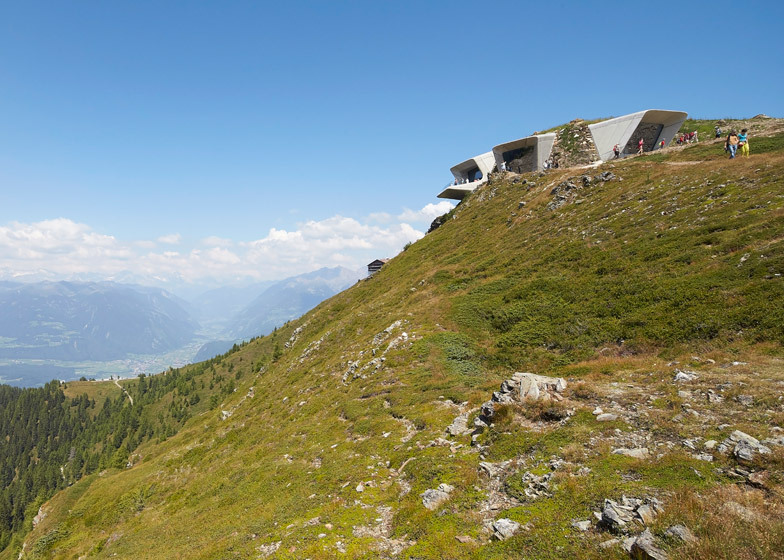 The Messner Mountain Museum, though one of her lesser known works, is a favourite of Hadid’s designs. Sadly, today world-renown Iraqi born, British Architect Dame Zaha Hadid died in Miami, Florida succumbing to illness at the age of 65 … a brilliant design mind and formidable female Architect whose loss will be grieved by many.